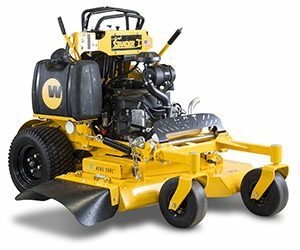 Wright Manufacturing added the 42-inch deck to its Stander Intensity mower. The Aero Core deck design features improved airflow, cut quality and anti-blowout features, according to the company. The floating Aero Core deck tilts side to side and front to back, allowing the mower deck to better follow terrain contours and improving the weight distribution for better handling on hills, Wright said. The deck height can be adjusted “on the fly” in quarter-inch increments, and anti-scalp rollers automatically adjust the deck height to changes in terrain. Recessed caster wheels reduce the turning radius, which, combined with the compact footprint and control and handling, allow operators to trim as they mow. The Stander I’s stand-on platform absorbs rough terrain through progressive elastopolymer bumpers, which accommodate various operator weights. The wide stance provides greater control, and its forward slant makes the controls more ergonomic, according to Wright. In addition to the 42-inch deck, Stander I mowers are also available in 36-inch, 48-inch and 52-inch deck sizes. Engines range from 18.5 hp to 22.1 hp.